This collection of linked prose poems documents a story in two parts, told by an unnamed narrator. As described in the title, things are taken away, and the taking is always done by an unexplained they. A friend of mine who also read it said she was surprised how much she liked the book, considering her usual distaste for dystopian literature, and Sweeney’s book does have a distinctly dystopian quality to it. The first part explains what is actually taken away, and each item/thing is given its own prose poem. Some of the early items are very tangible, like sunscreen, shoes, and bags, and the poems describe the general public’s reactions, how they change their lives to survive without these things they were used to. However, the things quickly become more abstract when things like the color maroon, constellations, and God’s name are taken. they said. What we do is call him Hashem. yellow sheets. Our marble steps never stopped to echo. I often asked myself, how are these things being taken? Did “they” come in during the middle of the night and take all of the shoes? All of the bags? Who are they? How did they take the constellations, God’s name from our lips and minds? But these questions go unanswered. Sweeney is solely interested in the items and their aftermath. The reader has to accept the mystery of the situation, and I did. the skewered eyes were going to see. The first part of the book is more comical and shocking (as the reader gets their bearings in the situation), but the second part is heartbreakingly moving, and I was impressed by Sweeney’s ability to move an audience with so few words—they are short poems, totaling less than fifty pages. Also, the narrative voice is colloquial, so the whole thing has the feel of an oral narrative. During the first few poems, I wondered about the narrator, but then I forgot about him/her until the final poem in the collection, when they finally participate directly. This ending made the whole book suddenly feel more personal, because I had a character to connect to. 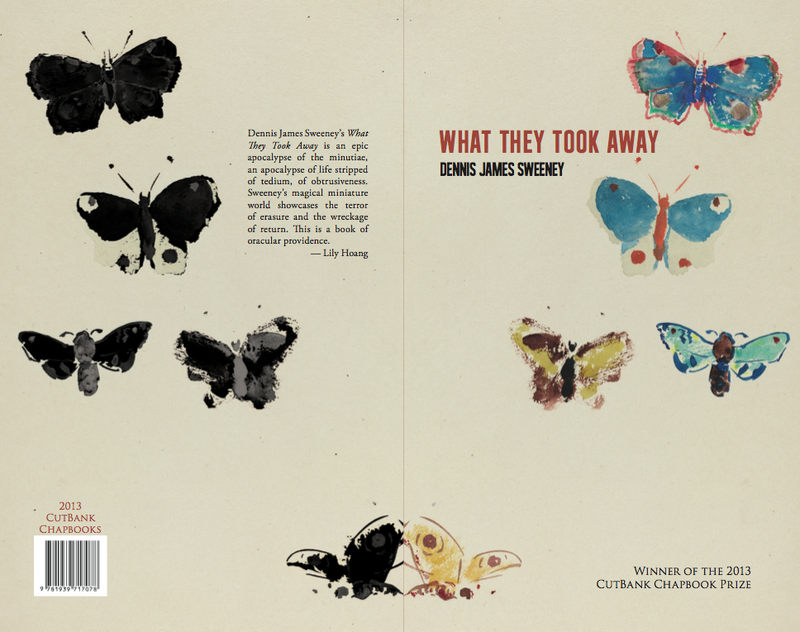 It is such a pleasure to be reviewing What They Took Away, not only because it is the best chapbook I have read in a while, or because it was the winner of the 2013 CutBank Chapbook Prize, but also because Dennis is a friend of mine, and I’m very proud of him. His diction is concise and purposeful, and these prose poems move easily between concrete and ethereal subjects. I talked to Dennis about the process of writing What They Took Away, and he said he wrote the first draft of the book within a few weeks, and that it was one of the most exciting times he has had in his writing career so far. This energy definitely comes across in the work—I suggest it to anyone looking for a powerful reading experience, but especially those interested in prose poetry or cross-genre literary works. Ellie Francis Douglass was born and raised in Texas. She studied English Literature at St. Edward’s University, where she studied under the poet Carrie Fountain. She is now getting her Masters in Fine Arts degree in Creative Writing at Oregon State University in Corvallis. Her poems have been published in The Dirty Napkin and Northwind Magazine, and she has work forthcoming in Bird’s Thumb.